Photo courtesy Marion Duckworth Smith. Marion Duckworth Smith sometimes wears a gold pin on her blouse that reads “Lady Legacy.” This accessory, which was given to her in 2004 by Henry Stern of New York City’s Historic House Trust, is the first clue that she knows something about what can be preserved over time and what fades away. Her house is the second. 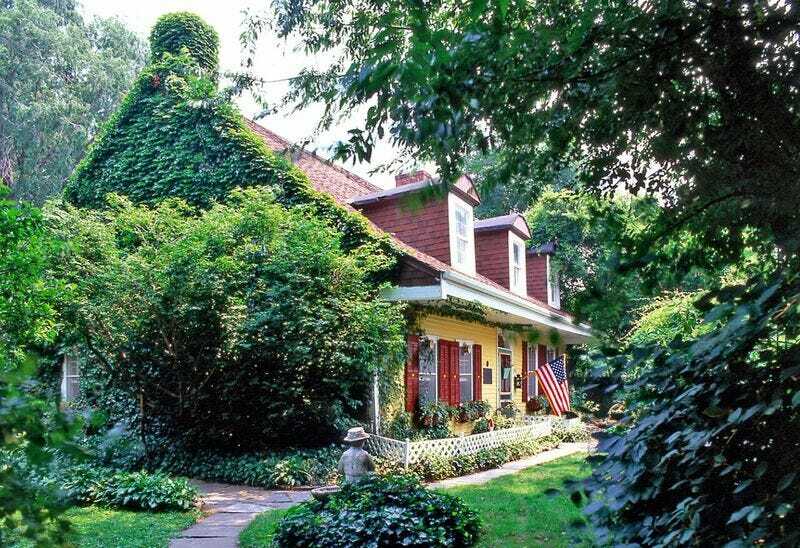 A Dutch farmhouse built from 1654 to 1656 by Abraham Riker, the Lent-Riker Smith Homestead in East Elmhurst, Queens is one of New York City’s oldest homes and possibly the city’s oldest inhabited historic home. Marion moved into the house in 1983, when she married her late husband Michael, who died in 2010. Michael published media directories, and she was an assistant in his Manhattan office. He had purchased the house in 1975, after the death of the last of the Rikers. She saw the property for the first time in 1979, on their second date; he asked if she would like to see his cemetery, and she said yes. Although the house and its grounds were in a state of disrepair, Marion was enamored. Over three decades, she has restored both the original farmhouse and the ground-floor sitting rooms and upstairs, which were added in 1729. The house survived a fire and Hurricane Sandy. And it’s not an easy place to own. Although she generates some revenue by giving tours, she pays about $100,000 per year to maintain the property and its grounds. But at age 75, she doesn’t want to move. The homestead isn’t a museum, with rooms cordoned off with red velvet ropes. It’s alive, and it’s her home. And it houses more than Marion: it also house her extensive collections, and more than anything, these possessions give it its distinctive character. Every room is filled with meticulously arranged memorabilia; every wall is covered in art. In the entrance hall, a display cabinet contains old family documents, books, and newspapers clippings, an ivory comb, thimbles, a pocket watch, and skeleton keys that have been unearthed on the property after rainstorms. Every object has a story. When Marion first took up residence, she found that some of the Riker family’s stories were tucked away in the padlocked attic. Michael had never explored the space, but she discovered that it was filled with old ledgers, correspondence, receipts, and cancelled checks tied with pink satin ribbons. She sat up there for days, reading through the family’s letters. But now the house feels uniquely hers. It’s an autobiography, a life mapped out in extraordinary things. Marion has something of the grand dame about her—and a collection of Hollywood memorabilia to prove it, including Gloria Swanson’s dog’s rhinestone-encrusted collar (Swanson named the dog Max after the butler in her 1950 film Sunset Boulevard), the lingerie cases of Mae West and Bette Davis, and Joan Crawford’s monogrammed pillowcase and handkerchief. Marion even has a bit of Hollywood history in her family. “My sister won an Ava Gardner look-alike contest in 1957,” she says. Her love of performance also extends to the stage. She has over 100 Playbills, a portrait of Yvette Chauviré from the Ziegfeld Follies, a fire hydrant from the auction when Cats closed, Chita Rivera’s dancing shoes, Keith Carradine’s tambourine hat from the Will Rogers Follies, and Carol Channing’s glittering necklace from Hello, Dolly!, displayed on a mannequin head. Some of her theatrical collections connect her to her brother, an aspiring actor who died of AIDS in 1988. Marion also has a fondness for the macabre. In the sitting room at the back of the house, her mother’s painting of a human skull hangs on one wall. On a nearby ottoman are an actual skull and the melted wax skull from Ralph Fiennes’ 1995 Broadway performance of Hamlet. And then there is the property’s cemetery, where 132 members of the Riker family are buried, including Captain Abraham Riker, who died at Valley Forge on May 7, 1778. It resembles a secret garden—pleasantly shady and overgrown with ivy and, in the summer, thick with mosquitos. Some of the headstones are toppled, their engravings faded with time. The Rikers are rendered in initials—J.L.R., W.R., A.C.R., A.R., J.R., D.R., J.R.R.—like variations on a theme. Michael is buried there, as are her mother and brother. Marion is fond of the cemetery, and an old photograph depicts her standing among the stones, dressed in white like a Brontë heroine. Ultimately, the macabre and the dramatic come together in Marion’s collection of slightly sinister chalkware Snow Whites, which she displays in neat rows in her solarium. Until recently, she had two dozen of these early twentieth-century carnival prizes. Now, only half remain. These trophies remind her of her childhood. Marion came across one of her Snow Whites in Paducah, Kentucky for $3, and she has a close friend in Fredericksburg, Virginia who looks out for them, as well. On June 10, she showed some of them off at the City Reliquary’s Collector’s Night at the New York City Fire Museum. She also collects chalkware Donald Ducks and Charlie McCarthys. Once, she came across a Donald Duck in a store in the South but didn’t buy him because she hadn’t yet started that collection. When she went back a year later, he was still on the same shelf at the back of the store, so she bought him. For Marion, collecting is about memories, and her things connect her to the past. Susan Harlan is a professor of English literature at Wake Forest University and a writer whose work has appeared in venues including The Guardian US, Roads & Kingdoms, McSweeney’s Internet Tendency, The Awl, The Morning News, Curbed, Literary Hub, Dame, The Common, Avidly, and The Hairpin. Marion Duckworth Smith gives tours of her home and property.